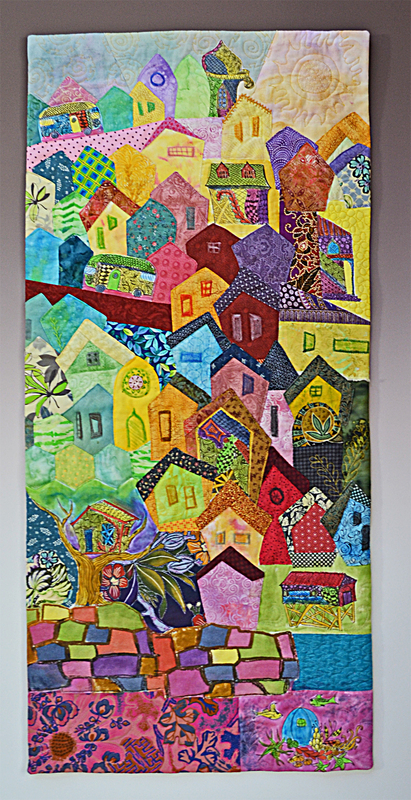 Visitors to the September Studio Tour saw this quilt in the early stages. I read that AirBnB was the hospitality sponsor for the summer Olympics in Rio, and that led to lots of imagined little houses and other buildings climbing up the hillside from the bay. Some of the buildings are zentangle drawings from my notebook, printed onto fabric and then painted to fit into the neighborhood. Two micro-buses are climbing the hill. Will Uber also be there? Rio Mio will be at a the SAQA show, ‘Above and Beyond’ at the Lakewood Cultural Center, opening January 22nd.